Drew Struzan And Bob Peak Art On Display… At A Cemetery? Two of the legends of movie poster art, Drew Struzan and Bob Peak, are getting an exhibit of their work at the Forest Lawn Museum in Glendale, CA. The exhibit, called The Masters Of Movie Art runs January 24th through March 26th. Now some of you may be thinking… wait, isn’t Forest Lawn a cemetery? Yup. Turns out this may be one of the best kept secrets in Southern California. Forest Lawn Cemetery has a small museum that is open to the public with free admission. I’ve lived in and around Los Angeles my whole life and had never heard of it. Nor anyone I’ve asked about it since. So if you are looking for something cool to do in Los Angeles in the coming months, go check out some of the best movie poster art of all time… in a very unique place. And I got through the article without making one cliche joke about cemeteries. For more information you can go to the museum website or Bob Peak’s website. What will be BIG in comic book and genre entertainment on the small screen in the new year. Lying In The Gutters – The Twenty Most Popular Posts Of 2013. And Then The Twenty Most Popular Comics Ones. Happy New Year From The UK. Image courtesy of The Outhousers. It’s midnight here in the UK, where Head Comics Writer Rich Johnston and Head Film Writer Brendon Connelly are toasting your health. Richard has champagne from Fortnums, Brendon has Mountain Dew. But the principle is the same. Bleeding Cool is coming up for its fifth anniversary, and there is so much to come in 2014. But for now… which were the most-read stories of the year? Looks Like Paul McGann Has Filmed A New Doctor Who Something But What? The Doctor Who Missing Episodes Rumour Gains A Little Momentum. Three Tons Worth. Does Original Killing Joke Artwork Reveal Greater Sexual Intent For Batgirl? Will Nightwing Get Civil Warred? WTF? Does Red Hood And The Outlaws #19 Full Cover Have Death Of The Family Spoilers? Did Bruce Wayne Make The Cruelest Betrayal Of All? Could Sunstone Do For Graphic Novels What Fifty Shades Did For Novels? Sony is staging a high-profile promotion for Amazing Spider-Man 2 Exclusive in Time's Square on New Year's Eve. 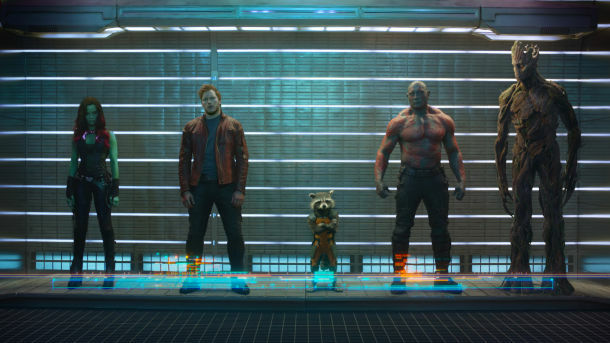 Disney and Marvel Studios released their first official photo from next summer's Guardians of the Galaxy today. Check it out below along with a new official synopsis for the James Gunn-directed comic book movie. 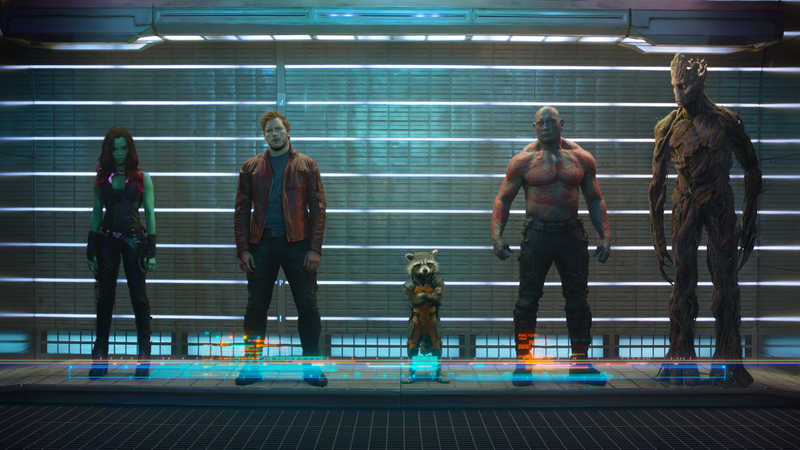 Guardians of the Galaxy: Zoe Saldana as Gamora, Chris Pratt as Peter Quill, Rocket Raccoon (voice of Bradley Cooper), Drax the Destroyer (Dave Bautista), and Groot (voice of Vin Diesel).